at the Hanoi Hilton, and staged a courageous battle against cancer. He is a patriot's patriot. Put his name in Google, and you can read lots about him. And send a prayer to his wife Charlene. There, but for the grace of God, go I. God speed, Ron. 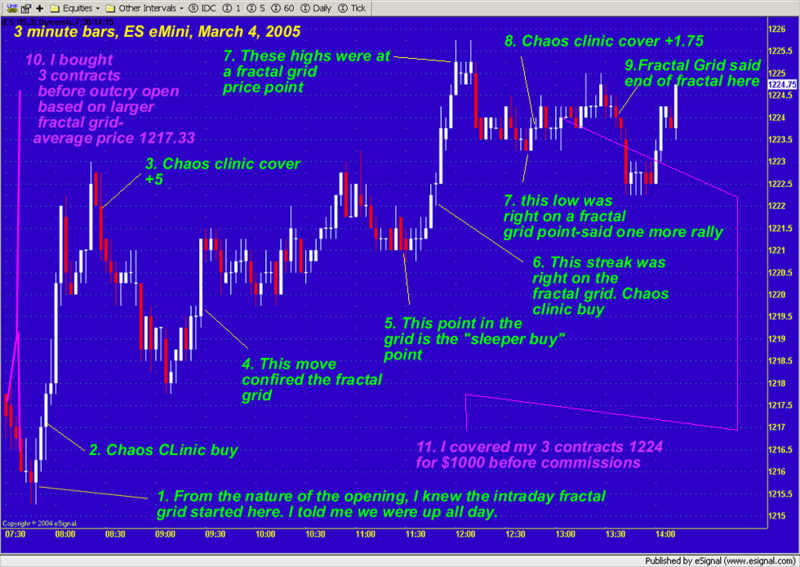 This is the Chaos Trading Made Easy chart mentioned in the text. It does not show the fractal grid, since that is part of the course. But it does show key information points. 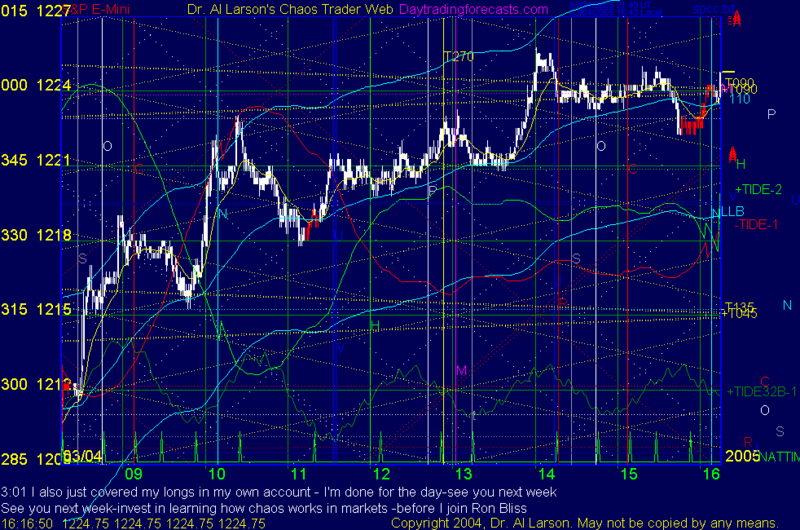 3/4/2005 1:19:56 PM Mountain wlj:: from 14 time 0n chaos screen we seem to be repeating 12 hrs ago in the overnite chart. if so from 14 time down for 90 min = 15:30 then up. 3/4/2005 12:19:00 PM Mountain smm:: you are watching more than the exmas and natural times? 3/4/2005 12:08:58 PM Mountain mjs:: I and my chart are EST (Wash. D.C.)took me a month to get 3 charts set up the way I want. Last 2 days working wonderful. 3/4/2005 12:01:01 PM Mountain mjs:: My turn time was 13:51 missed by 3 min. 3/4/2005 7:35:35 AM Mountain wlj:: in 1987 a cluster of planets passed over 0/360 during the middle of the oct decline. this rally started feb 23 so perhaps another middle of a move push. 3/4/2005 7:00:43 AM Mountain wlj:: venus uranus pluto mars merc moon are on, passing over or within one deg of the 0/360 deg line on the 24 wheel. as a rule so many passing over at same time = big moves. big daily swings last few days, al is looking for a move soon. all seems to fit. 3/4/2005 6:42:08 AM Mountain wlj:: start locking your doors at night, martha is out of prison.